Allie and Bailey, both bottlenose dolphins, shared tank time in Florida when the two dolphins were calves, aged 4 and 2. The dolphins had lived apart for more than 20 years when Bailey, now a mother of four, heard Allie's signature whistle played over a pair of speakers at her tank at Dolphin Quest in Bermuda. And she remembered. "She came swimming up to the speaker and hung around there for a little while she listened in," Jason Bruck, a biologist at the University of Chicago who played the tape for Bailey, told NBC News. Bailey is one of the stars of a new study providing the first statistically backed evidence that dolphins can remember their friends and foes for decades. In this week's issue of the Proceedings of the Royal Society B, Bruck reports that bottlenoses might have the longest social memory in the animal kingdom — even longer than humans, if you consider that our faces and voices change with time. For more than five years, Bruck traveled to aquariums and zoos across the country, giving memory tests to 43 dolphins of all ages. He installed speakers in the dolphins' tanks and played back the whistles of their former pals, after up to 20 years of separation. 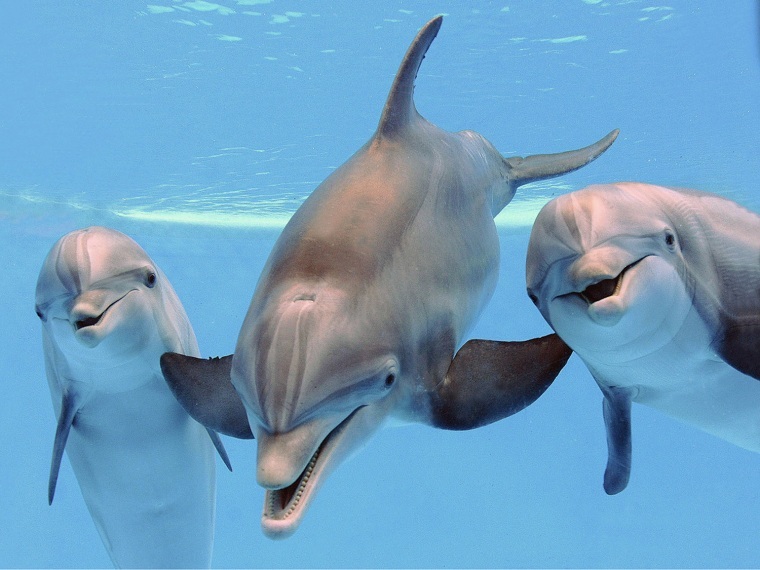 Just as humans recognize each other by faces and voices, dolphins identify themselves and each other by signature whistles, adopted when they are calves. "They're conceiving of these signatures as people conceive of names," Bruck said. Human faces crinkle and voices crack as we grow older, but dolphin whistles are built to last for life — they stay stable over decades. And so also, it seems, do dolphin memories. Dolphins of all ages, except for some very young ones, responded to familiar whistles from long ago by swimming towards Bruck's speakers. Males adopted a reactive aggressive pose when the call of a dominant male was played back at them. When unfamiliar whistles were played back, they tended to ignore them. Dolphins responded to the whistles of family members, tank mates and one-time flames that they'd mated with. Age didn't seem to dim their recall. Semo, 45 — who is "ruggedly handsome" and lives with ladies Chelsea, Jasmine, Bella and Mattie at the Six Flags Discovery Kingdom in Northern California — is the longest living male in captivity in the U.S. This "dirty old male" was "pretty good" at responding to the whistles of friends from long ago — that is, "when he wasn't chasing other lady dolphins," Bruck said. In other words, "there was no geriatric effect." In the wild, bottlenoses are social, and can be separated for years at a time. So a long-term memory could come in handy to recognize friendly pods. But dolphins are also notoriously nasty and violent toward rival groups. Bruck said a sour encounter could result in a lasting grudge — or, at the very least, the alertness to avoid an area if a warning whistle is heard. For dolphins, sound trumps sight because they can hear each other before they can see each other. Bruck says he can't yet say if the dolphins were matching lingering memories to dolphin faces — that is, if they were picturing the individuals in their heads as they heard the whistles. What he could tell was that the animals responded as if their old friends were "sitting right in front of them." Can dolphins 'see' pregnant women's fetuses? Jason Bruck's study, titled "Decades-long Social Memory in Bottlenose Dolphins," appears in the Aug. 7 issue of the Proceedings of the Royal Society B.